DAUPHIN ISLAND, Alabama (AP) — Tropical Storm Gordon never became a hurricane but it was deadly all the same, killing a child by blowing a tree onto a mobile home as it made landfall. The storm later weakened into a depression on Wednesday, dumping heavy rains across southern states. 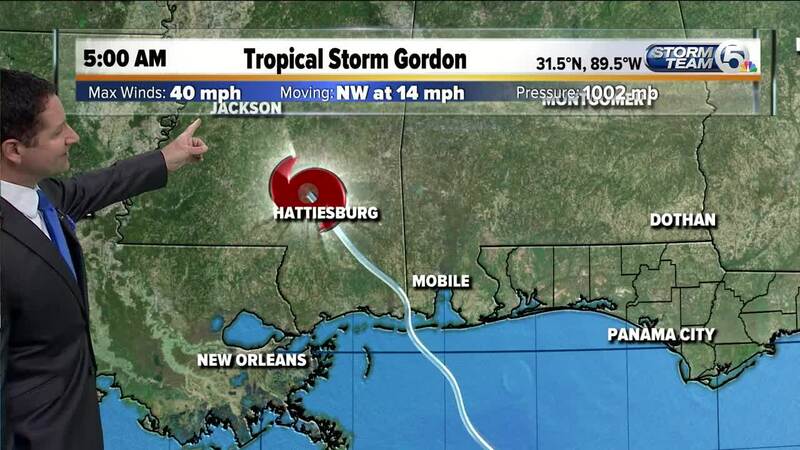 The National Hurricane Center said Gordon was weakening on a path into Arkansas after striking the coast at 70 mph, just shy of hurricane strength, near Pascagoula, Mississippi. The remnants will likely cause flash flooding across parts of seven states and as far north as Iowa in the coming days. The storm was going out swinging: Forecasters said radar spotted possible tornados spun off by the storm overnight in southern Alabama and the Florida panhandle, and more were possible through Wednesday night in Mississippi and western Alabama. Driftwood and other debris on the causeway made for hazardous driving early Wednesday to Dauphin Island, Alabama, which was partly flooded by seawater overnight, leaving people to drive over sand and around lawn furniture on the main road in the wake of the storm. Siding was peeled off some houses, but Mayor Jeff Collier said "for the most part, we did OK."
The center predicted total rain amounts of 4-8 inches (10-20 centimeters) in the Florida panhandle and parts of Alabama, Mississippi, Louisiana, Arkansas, Missouri, Iowa and Illinois. Rainfall could be even more intense in isolated places, dropping up to 12 inches (30 centimeters) through early Saturday. A storm surge covered barrier islands as the storm blew through, and some inland roadways were flooded as well. The National Weather Service in Mobile cautioned that the Styx River near Elsanor, Alabama, could reach moderate, and possibly major, flood stage later Wednesday. But the storm's impact could have been worse: Gordon gave only a glancing blow to New Orleans, where Mayor LaToya Cantrell said the city now has "the pumps and the power" needed to protect residents inside the levee protection system. There were no immediate injury or significant damage reports, other than the tree that fell on the mobile home in Pensacola. The Escambia County Sheriff's office posted on its Facebook page that responding deputies discovered that the child had been killed. The name and age were not released. More than 27,000 customers were without power as Gordon began pushing ashore, mostly in coastal Alabama and the western tip of the Florida Panhandle around Pensacola, with a few hundred in southeastern Mississippi. Crews were already restoring electricity early Wednesday. Rain was still falling but the lights were on Wednesday morning at a Waffle House restaurant in Mobile, where factory worker Jerome Richardson said he lost power at 9 p.m. as the storm passed overhead. He was still without electricity as he left for his 12-hour shift. "I just hope I don't have to throw out everything in my refrigerator when I get home," he said. The last hurricane to strike the U.S. was Nate last October, coming ashore in Biloxi with 75 mph (120 kph) winds. Governors in Alabama, Mississippi and Louisiana all declared states of emergency to better mobilize state resources and National Guard troops for the storm. Mississippi shut down a dozen Gulf Coast casinos. Workers on at least 54 oil and gas production platforms were evacuated. Communities along the coast provided sand and bags, and many hustled to protect their properties ahead of the storm. Gordon was not the only storm being watched by forecasters. Hurricane Florence was some 2,400 miles (3,900 kilometers) away from the U.S., and lining up behind it, another potential storm was likely to form not far off the coast of Africa. It's way too early to know if either of those storms will have any impact on land, but Hurricane Center Director Ken Graham said attention should be paid: "It's the peak of hurricane season. Now is the time to get your plans all set," he said. Associated Press contributors include Stacey Plaisance in Gulfport, Miss; Kevin McGill in Bay St. Louis, Mississippi; Jeff Martin and Ben Nadler in Atlanta; Emily Wagster Pettus and Jeff Amy in Jackson, Mississippi; Kim Chandler in Montgomery, Alabama; Rebecca Santana in New Orleans; Melinda Deslatte in Baton Rouge, Louisiana; and Jeffrey Collins in Columbia, South Carolina.